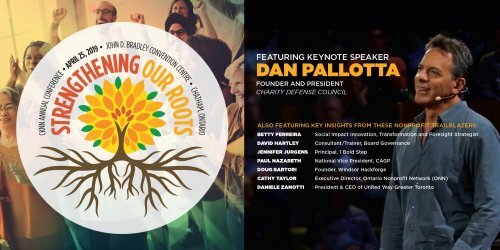 Join hundreds of other nonprofit sector leaders and supporters for their 5th Annual Chatham-Kent Nonprofit Conference, "Strengthening Our Roots", featuring world-renowned charity guru, Dan Pallotta. Dan has generously agreed to make himself available for an exclusive speaking engagement and book signing opportunity, featuring his latest book, "Uncharitable". In a time of change unlike anything we've ever experienced in our sector before - with new governments, new and revised policies and regulations, and increasingly complex challenges in our local communities - it's important that we share our thoughts, collect ideas, discuss solutions, and get inspired. Are the roots of your organization strong enough to withstand these powerful and unrelenting winds of change? Don't allow your organization to be left behind. Together, we will learn how to strengthen our individual organizations, our networks, and our sector as we adapt to these new demands and ways of working that are being thrust upon us at lightening speeds. Arm yourself with the most up-to-date information, so that together, we can continue to help our communities prosper and thrive.